Please join me in welcoming Wild Rose Press author, Marin McGinnis, here with the release of her second book, SECRET PROMISE. Hello, Marin. Welcome and congratulations on the release of your second book, SECRET PROMISE, the story of Anna and Edward. How easy is it for you to come up with your character names and book titles, especially since you write historical romance? Book titles usually require me to ask someone else to help, since I am terrible at them. My first book was titled at a NEORWA retreat while drinking wine. Character names involve a bit more research. I like to check the census records for people born roughly at the same time as my characters to come up with names, although every once and awhile one just pops into my head and stays there. Aside from SECRET PROMISE and your first book, STIRRING UP THE VISCOUNT, do you have a favorite book? I like so many different types of books it’s impossible to pick a favorite. My first romances were Jane Austen’s, so if I were forced to choose I’d probably say Pride & Prejudice. Ahhh, Mr. Darcy. Well, let’s give the readers an excerpt from SECRET PROMISE and a chance to meet your hero, Edward. Before we get to Marin’s bio, the buy links…and the rafflecopter draw, I have one more question for Marin. Aside from writing (and all the research involved), do you have any hobbies? I like to make beaded jewelry, although I haven’t found much time for that since I started writing in earnest. I am also an amateur genealogist, which is a tremendous amount of fun in a geeky research kind of way. I can spend hours and hours happily digging around in my family tree, so I can’t do it too often or I’d never get anything else done! Well, it seems you are a big fan of research! Thank you, Marin, for visiting today. 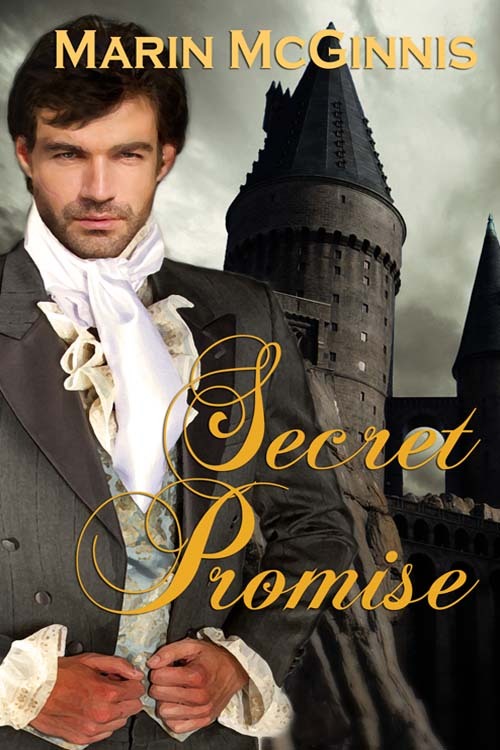 This entry was posted in Author Visits, Charlotte Copper, Historical Romance, Wild Rose Press and tagged historical romance, Marin McGinnis, Secret Promise, Stirring up the Viscount, The Wild Rose Press by Charlotte Copper. Bookmark the permalink. Thanks for having me here on your lovely blog today, Charlotte! And thank you for visiting, Marin.